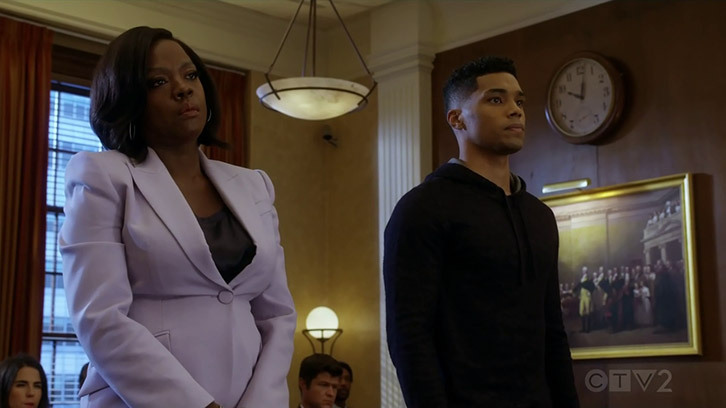 How To Get Away With Murder - We Know Everything - Review: "Four On The Trot"
It seemed almost unthinkable late last year, but since the Christmas break ABC's How To Get Away With Murder has put out four very good episodes on the trot now. The back half of the season has shown some good signs, but I get the feeling that it has finally come alive thanks to last night's episode. "We Know Everything" was written by Michael Russo and Sarah L. Thompson, and directed by Jennifer Getzinger. The key thing the writers room did in this hour was ensure the episode was kept simple. Each event was designed with purpose, and there was next to no filler content to speak of. 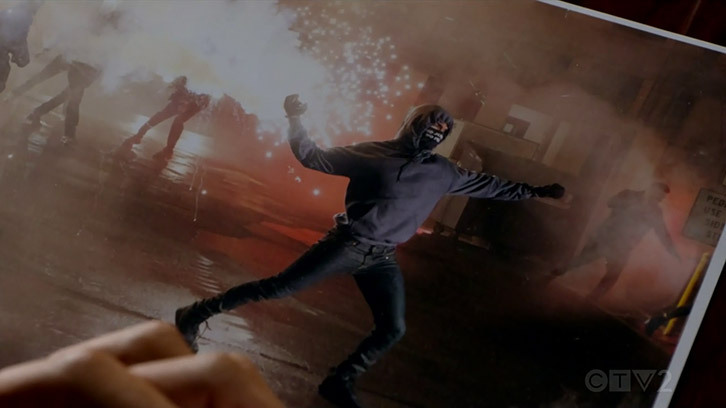 We wasted no time learning why Gabriel had been imprisoned, with the startling revelation being made in the opening minutes in court that Gabriel was being held on domestic terrorism charges based on the Patriot Act, and stemming from a photo depicting him throwing projectiles at a civil rights protest. The revelation that Gabriel was involved in this sort of thing did come out of nowhere, and I did get the feeling that the race card was definitely being milked here somewhat unnecessarily, but the fact that this whole stint was kept very simple is, to me, more important. His fellow students have always been highly suspect of Gabriel, but I think he won their respect in this hour which is very important going forward. Asher, Connor, Oliver, Laurel and Michaela were all keen on pinning Miller's demise on Gabriel, but after Annalise managed to bring him on side by revealing Wes killed Sam - his father - the FBI is being directed right where they want them to be, which is towards Governor Lynne Birkhead, and not toward them or Annalise. The second courtroom scene which saw the charges against Gabriel dropped was a telling moment for trust being built in the other direction, despite it taking a hit initially once Gabriel realized he had been under constant surveillance for a long time. Fortunately for him, the footage showed that the evidence the FBI had against Gabriel was planted, and he was a free man. In a moment of goodwill - and bucketloads of sexual tension - Michaela went to Gabriel's place and disabled the camera for him. I can't help but wonder if this was a mistake because now any further tampering from anyone else won't be able to be recorded. Time will surely tell. There's a world in where you're OK with what you did. Off to the side somewhat were Nate, Frank and Bonnie, but they did have important parts to play in this hour. Frank managed to dig up more evidence which proved beyond doubt that Miller was, at a minimum, using his trust in Bonnie to work against Annalise for the Governor as it was him who tipped the Governor off that Annalise was looking to adopt Wes all those years ago. In and of itself, that evidence isn't significant, but when coupled with Sam's death it connects Annalise rather awkwardly, which is why she wants to avoid it. I'm not the one killing people around here. I just clean up the mess. Perhaps the most unnecessary moment in the episode was Bonnie receiving calls from Miller's mother, with her asking Bonnie to help plan a memorial service. The only reason I can think of for why this would be included would be to throw some doubt into Bonnie's mind, and provide an alternative ending of sorts where someone actually confesses to a murder. The key factor for her will be whether Miller's indiscretions with the Governor convince her to keep silent. 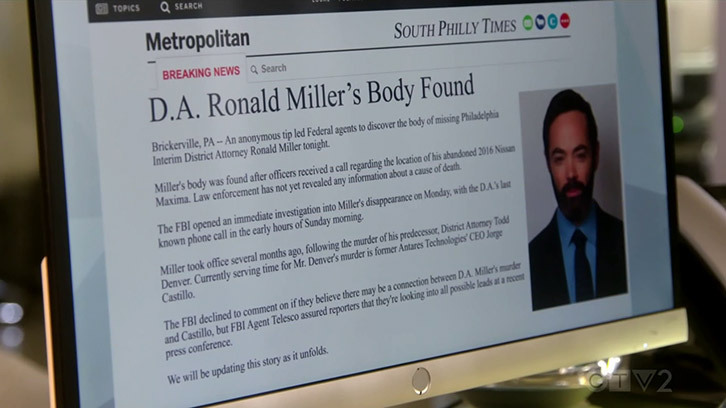 Nate, meanwhile, capitalized on the FBI's momentum shift towards the Governor to tip off the police as to the location of Miller's body. News reports said it was found in an abandoned vehicle which is probably the preferred disposal method because it leaves more questions unanswered. Here's hoping Nate was smart and didn't leave any evidence behind. The happenings in the Caplan & Gold office posed a handful of questions in this hour. Tegan's history was touched on rather firmly, along with the fact that the FBI protected her after the Castillo debacle seen in the previous season. My only question is why the FBI protected her when they didn't offer protection to anyone else. It speaks to there being a late change in the writers room to give Tegan some purpose in the back half of the season. Regardless, Oliver, with Annalise's approval, exploited Tegan's FBI protection by reaching out via an anonymous email revealing the sender knew her protected identity was Jane Doe. The effects this will have aren't known yet, other than perhaps forcing the odd second thought going forward. Simultaneously, Emmett had a been in his bonnet over not being told about Annalise's representation of Gabriel, and subsequent win in court. He also requested access to Annalise and Tegan's emails, with Annalise picking up on that when he asked her if she trusted Tegan. Her response was perfect, but I don't understand how going after Annalise or Tegan now provides any benefit to him whatsoever. To be fair to him, his idea to drum up some publicity for Annalise's win in court was a good idea, and would have backed up the race card being played to great effect. This episode didn't disappoint in the cliffhanger department either. 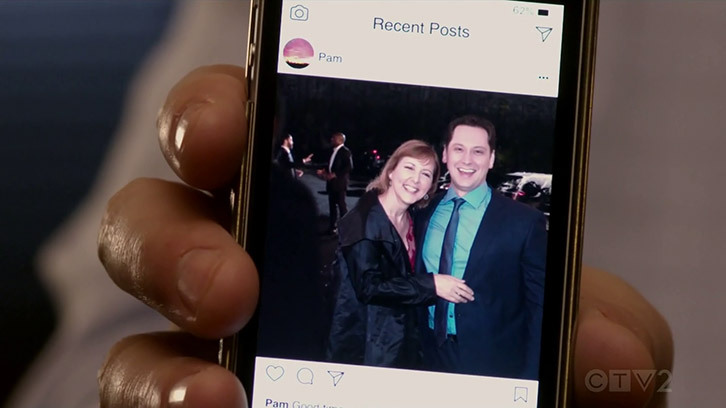 On Instagram, Connor's mother posted a photo of her and Asher, but what was happening in the background was of much greater concern. Nate and Miller can be seen talking. The photo is taken by someone else a well, which could indicate there's a witness that is yet to come forward and who may have seen something. I can't imagine this ending well. 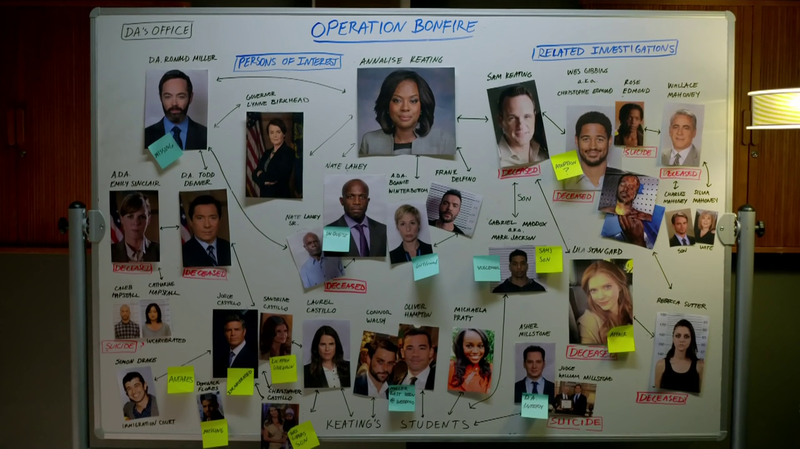 A final point worth mentioning is that it was great to see a murderboard, which the FBI agent was using to put the pieces together in what is codenamed 'Operation Bonfire' - perhaps a reference to the first season where a bonfire was very important. Click on the image below. It'll expand for you to take a closer look at. In all, this was another decent episode of How To Get Away With Murder. It kept things simple, and there was no filler content to speak of. If the season's three remaining episode retain this level of quality it could be one of the greatest turnarounds in a season that a series has ever pulled off. It's not the best work the creative team have come up with, but when compared to the boring and dreary front half of the season, this back half has been very good viewing so far. As I discussed in last week's review, a showdown with the Governor will be the climax for the end of this season. There's water to go under the bridge yet, but now that Miller's body has been found we'll have something to enjoy next week at least. That's all I've got to say about this episode. Thanks as always for reading, and I'll see you right back here next week. In the meantime don't forget to leave your thoughts and theories on this episode in the comments below.